Over the past couple of years we have enjoyed a number of visits to Orocco Pier in South Queensferry (found north of Edinburgh, a 20 minute drive from the city centre) for lunch, dinner and coffee. In a shore front location with views across the Forth between the Forth Road Bridge and the Forth Railway Bridge, Orocco Pier is a comfortable, contemporary bar and restaurant. We were in a group of nine, six there for the first time and impressions were good, all loving the location and the night views across the water to the lit Forth Railway Bridge. We arrived early with a view to having a pre-dinner drink, but they showed us to our table early to be more accommodating. Drinks ordered, we considered the varied menu. Some starters were ordered, mussels in white wine, cream and garlic with crusty bread being a popular choice (£5.25), although a wait for the bread to accompany the mussels was forced upon my friends. A reminder about the bread eventually ensured its arrival. The Kiwi ate the Sticky lemon, ginger, sesame seed and beef salad (£4.95), a little surprised it was cold but then realising since it was a salad that probably would have been the case, and rated it “fine”. The anti-pasti sharing plate looked good and well put together and was thoroughly enjoyed. Four of us decided that the Orocco Main Today special sounded good being roast lamb with roast vegetables, gabbage on mustard mash. When it arrived we were surprised to see there was no gravy or sauce, and on tasting we all agreed the lamb was dry and the mustard mash was over-powering. I found it so dry that I asked for some gravy, which a few minutes later appeared and this helped the cause. One friend wanted me to note that from his male perspective there wasn’t enough meat. We were left disappointed, thinking that a “special” would be just that, but instead felt it was more of an afterthought. That said, the Kiwi opted for the normal menu Lamb course – Roasted rump of lamb with rosemary potatoes and sweet port reduction (£14.95) and was pleased to see that on arrival it was cooked rare as requested, and it made a handsome winter plate of meat but caught short on accompanying vegetables. Another of our party had the Marinated five spice duck with sesame noodles in Hoi Sin jus, pak choi and bean sprouts (£14.95) – Winner! I had a taste and had instant menu envy, as did the rest of the party! Duck was tender and pink, the noodles tasty although I did find the hoi sin jus a bit on the sweet side, but the food looked and tasted great! 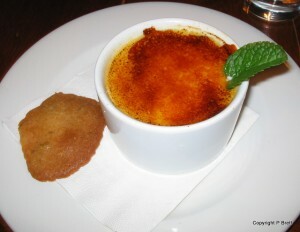 Vanilla creme brulee was a popular choice, and won all our votes as a lovely, light yet rich dessert, unfortunately this tasty dessert was not enhanced by the accompanying pistachio wafer biscuit which tasted greasy and bereft of any pistachios. 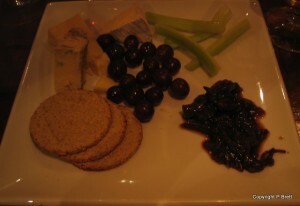 The cheese selection was good but on the stingy side although there seemed to be lots on the plate, with celery, grapes and red onion marmalade taking over rather than the cheese being the main attraction. Overall the evening was a success with all enjoying the location, atmosphere and for the most part the food but I would say that Orocco Pier is more successful in it’s lunch menu which is keenly priced and well put together. Possibly come the time for the evening menu it is trying too hard and although pretty good, I feel they just need to go that extra stretch to get it just right…. but I still like it! 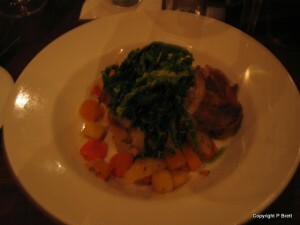 Tagged with Bar, Contemporary, Forth views, Orocco Pier, Restaurant, Review, Scotland, South Queensferry.